The 84th Annual Academy Award nominations were announced this morning by Tom Sherak, president of the Academy, and one of last year’s nominees for Best Actress, Jennifer Lawrence. We all were expecting a boring, predictable slate this year, but luckily there were some surprises to wake us up. 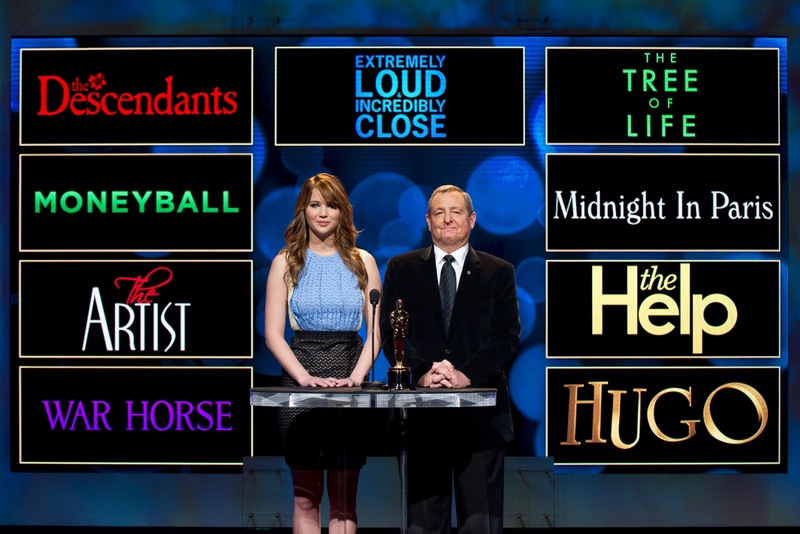 Oscar®-nominated actress Jennifer Lawrence (left) and Academy President Tom Sherak announced the nominees for the 84th Annual Academy Awards in the Academy's Samuel Goldwyn Theater. Photo by Todd Wawrychuk / ©A.M.P.A.S. The nominations announcement started off with the Best Supporting Actress nominees, and to no one’s surprise, category frontrunners Octavia Spencer (The Help) and Bérénice Bejo (The Artist) appeared. 2011’s It Girl Jessica Chastain managed to pull off a nomination for The Help despite having two other performances in the mix (The Tree of Life and Take Shelter). Some pundits predicted that her performances would ultimately cancel each other out, but she managed to pull through (even though the photo they used for her during the announcements was from The Tree of Life). Melissa McCarthy (Bridesmaids) and Janet McTeer (Albert Nobbs) filled the last two spots edging out newcomer Shailene Woodley (The Descendants). This category usually fawns over teen ingénues, but I guess Woodley is no Saoirse Ronan. As for Best Supporting Actor, winner (admit it, he’s got this in the bag) Christopher Plummer (Beginners) leads the pack, followed by expected nominees Kenneth Branagh (My Week with Marilyn) and Jonah Hill (Moneyball). Nick Nolte (Warrior) also sneaks in and, in one of the better surprises of the morning, Max Von Sydow pulls off a surprise nomination for his wonderful performance in Extremely Loud & Incredibly Close. No one expected that film to earn any major nominations, but Oscar always loves a mute. Along with Plummer, Drive’s Albert Brooks was this category’s major frontunner, but shockingly, he failed to earn a nomination. I guess Drive proved to be too dark or too much of a genre piece for the Academy’s tastes. “Too dark” seems to be a recurring theme in the nominations this morning. Tilda Swinton, who was on the fence, failed to earn a spot for the gloomy indie We Need to Talk About Kevin in favour of the new girl Rooney Mara (The Girl with the Dragon Tattoo). Mara’s murky exterior and reserved nature was her predicted downfall, but if she was left out, we would have five previous nominees. That hasn’t happened in this category since 1994. Oscar always loves a fresh young face in Best Actress and Mara is exactly that. Frontrunners Viola Davis (The Help), Meryl Streep (The Iron Lady), and Michelle Williams (My Week with Marilyn) continue their dominance, joined by Academy veteran Glenn Close (Albert Nobbs). In Best Actor, George Clooney (The Descendants), Jean Dujardin (The Artist), and Brad Pitt (Moneyball) are all expected nominees. The last two spots were up for grabs for anyone from Leonardo DiCaprio to the Michaels (Fassbender and Shannon). In one of this morning’s most pleasing nominations, veteran actor Gary Oldman earned his first ever Oscar nod for his spectacularly nuanced performance in Tinker Tailor Soldier Spy. Taking up the last spot was probably the most surprising of the acting nominations. Demián Bichir (A Better Life) pulled a Javier Bardem and stole that last slot. He’s a charming actor and I’m super happy for him – I’m kind of more ecstatic that I predicted him to be honest. So what did we learn from these acting nominations? SAG clearly knows what they’re doing. They nominated Bichir and also snubbed Brooks. There is some validity to precursor influence after all. With last week’s DGA announcement, the nominees for Best Director became more concrete. The only surprise was David Fincher’s name over Spielberg or Malick. Luckily, Malick edged out Fincher this morning and earned a much deserved nomination for The Tree of Life. Joining him are frontrunners Michel Hazanavicius (The Artist) and Martin Scorsese (Hugo), along with Alexander Payne (The Descendants) and Woody Allen (Midnight in Paris). This is Allen’s first nomination in this category since he scored with 1994’s Bullets Over Broadway. He earned a second nomination this morning for Best Original Screenplay as well. Its competition in that category includes The Artist, Margin Call, Bridesmaids (I’ve been waiting to say “Academy Award nominee Kristen Wiig" for three years now! ), and my favourite nomination of the day, A Separation. The adapted screenplay category isn’t as exciting, but still hosts some solid work: Tinker Tailor Soldier Spy, The Descendants, Moneyball, Hugo, and The Ides of March (earning Clooney a second nomination today). Other big surprises this morning included Drive earning only one nomination (Best Sound Editing), Project Nimmissing out on Best Documentary, Maria Djurkovic’s stellar Art Direction for Tinker Tailor ignored, The Adventures of Tintin left out of Best Animated Film, and in the biggest “WTF?” moment of the day, the Best Original Song category features only two nominees. Yep. You heard me right. Two. Last year we were all surprised when they only honoured four nominees in this category, but this is a new extreme. I know the year hasn't exactly been exciting in terms of original songs, but to list only two nominees? They didn’t even nominate the best song from The Muppets! This category needs some serious reevaluation because it has become a joke. They might as well just get rid of it altogether. Overall, I ended up predicting 83/119 of the nominations. I’m pleased with that; it’s a respectable 70%. Now that the nominations have been announced, we move into the second stage of Oscar predicting. This one is thankfully easier and a lot shorter. The ceremony for the 84th Annual Academy Awards takes place on Sunday, February 27th, just over a month from now. To check out a full list of the 84th Annual Academy Award nominations, click here.